The broader market has whipsawed over the past five months. The S&P 500 posted one of its worst quarters and since the Great Depression with the index selling off 14% and erasing all of its gains from 2018. 2019 started on a high note for the S&P 500 with January posting a 7.9% gain, logging its best January in over 30 years. This was followed by continued strength in February, putting the index on its best footing since 1991 with a cumulative return of 11% year-to-date. In this article, I’ll be discussing how options trading can generate consistent premium income with a high-probability of success, regardless of the market backdrop. This is accomplished since options are a bet on where stocks won’t go, not where they will go. Following the options trading mechanics described in this article, my options-centric portfolio resulted in a total portfolio return of 4.2% against the S&P 500 return of -4.4% over the previous five months. This timeframe provided both bear and bull market conditions to demonstrate the effectiveness and resiliency of options trading while outperforming the broader index by a wide margin. This seesaw from a negative to a positive market backdrop provided unique opportunities to capitalize on options trading via capturing a higher percentage of premium income. 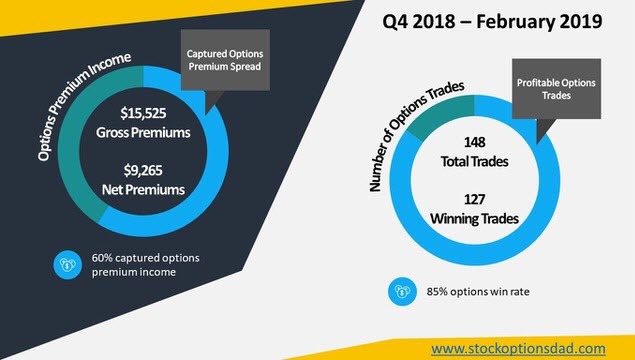 In January and February, I was able to achieve a 98% options success rate by closing 46 out of 47 option contracts while leveraging cash-on-hand. Options trading can be a fantastic avenue to mitigate risk, provide consistent income and hedge against market movements while maintaining cash-on-hand. Risk mitigation is particularly important given the market wide melt-down during Q4 of 2018 albeit the market has rebounded furiously thus far in 2019 through February. Maintaining liquidity via maintaining cash on hand to engage in covered put option selling is a great way to collect monthly income via premium selling. Heeding critical variables such as implied volatility, implied volatility percentile and probability, one can optimize option selling to yield a high probability win rate over the long term given enough trade occurrences. I demonstrated via empirical data how these critical elements translate from predictive high probability outcomes to reality. In the end, options are a bet on where the stock won’t go, not where it will go and collecting premium income throughout the process. These empirical data demonstrate that the probabilities play out given enough occurrences over time. Despite a small sample size (148 trades) in a period where the market seesawed from erasing all of its gains for 2018 to posting its best January/February since 1991, an 85% win rate was achieved while outperforming the broader market by a spread of 8 percentage points from October of 2018 through February of 2019 (S&P -4.4% vs. 4.2%). The main keys are to maximize the option seller’s edge via exploiting volatility (high IV percentile) and time premium decay. Stocks can temporarily become highly volatile with the expectation that this volatility will decrease in these high IV percentile situations. Rich premiums are paid out to option sellers with the expectation that volatility will revert to its mean, allowing the option to decrease in value and expire worthless at expiration even if the underlying stock moves sideways or down without breaking through the strike price in a high probability manner. The high IV percentile provides rich premium via time value and as the option lifecycle unfolds and this volatility decreases, the option time value implodes, and the option decreases in value allowing profits to be released earlier in the lifecycle without waiting until the expiration of the contract. The outcomes for put sellers are as follows; If the shares move in your favor (in this case the shares appreciate in value or trade sideways) the put seller has optionality where he can buy-to-close the contract at a profit or allow the option to expire worthless. Time decay is on your side through the contract lifespan so every day that passes, the option seller will gain value due to time premium evaporating. If the shares trade positive, sideways or decrease (without breaking through the strike price), then option gains are in the seller’s favor. A wide array of options in different sectors with different expiration dates will ensure portfolio diversity and plenty of opportunities to take profits. These empirical data demonstrate that the probabilities play out given enough occurrences over time. Despite a small sample size (148 trades) in a period where the market erased all of its gains for the year and then seesawed back into positive territory in January/February, an 85% win rate was achieved while outperforming the broader market by a wide margin. 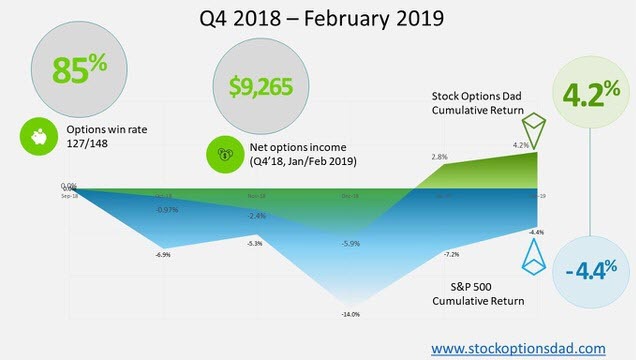 Accounting for all the contract income, assigned underlying positions that were relinquished at a profit and unrealized losses (total portfolio) yielded a return of 4.2% while the broader S&P 500 posted a return of -4.4% (Q4 through Feb 2019). The mechanics behind all these trades is an iterative process as described above and in the figures below (Figures 1, 2, 3 and 4). Out of the 148 trades (largely comprised of selling puts) 127 trades were closed at a profit, and 21 were assigned/forced relinquished thus non-profitable. Out of these 21 losses, 11 assignments were inevitably sold at a profit, and two were buy-to-close for a minor loss to avoid assignment or avoid relinquishment. Net losses were 8 and I was assigned General Electric (GE) (2 trades for a total of 9 contracts), United States Oil (USO) (2 trades for a total of 8 contracts) ETF, Schlumberger (SLB) (1 contract), Bank of America (BAC) (1 contract) and American Airlines (AAL) (2 contracts). In total, $15,525 of premium income was received over these 148 trades, and after all buy-to-close managing of the trades, $9,265 was netted, equating to a 60% premium capture. This translates into the ~50% premium capture that I target as a goal while accounting for all commissions and non-profitable trades. Despite the assignments and option losses, the portfolio easily outperformed the S&P 500 over the five-month period from October of 2018 through February of 2019 (S&P -4.4% vs. 4.2%). The stock market strength witnessed in January and February was a great opportunity to revisit assigned positions that previously moved against me and the probabilities. In my case, I was assigned several underlying securities in Transocean (RIG), eBay (EBAY), Micron (MU), Biotech ETF (XBI), Capri Holdings (CPRI) and Mexico ETF (EWW) in the market sell-off during Q4 of 2018. As the January/February strength lifted all of these assignments, I was able to sell these assignments at profits (sale price > assignment price) and capitalize on the market conditions provided. This market strength allowed these positions to be profitable and thus the ability to repurpose the capital for continued options trading. Position sizing is critical to successful options trading as one, or a few bad assignments (s) may erase all gains that were collected over dozens of trades, effectively negating all the successes. This is particularly true during periods of sudden bear markets like the one in Q4 of 2018. This is true with sector sell-offs as well like the secular decline in the financials largely due to the Federal Reserve stance on interest rate hikes and gas and oil-related stocks. General Electric (GE), United States Oil (USO) ETF, Schlumberger (SLB) and Bank of America (BAC) were all assigned to me and resulted in significant unrealized losses as these underlying positions broke through the one standard deviation threshold and continued to free fall. Some positions that were assigned at expiration were ultimately sold at a gain once the underlying position broke through the assigned price on the rebound (i.e., PYPL, WYNN, RIG, eBay, TWTR, MU, XBI, EWW, CPRI, and FCX). Sticking to the mechanics of selling options with high implied volatility, high IV percentile, one standard deviation out-of-the-money for an ~85% probability of success and great liquidity provides rich option premium selling. As volatility decreases, the option contract will decrease in value providing the option seller with the potential for realized gains. Taken together, this translates into high probability options trading to maximize option outcomes regardless of directionality and market backdrop. Despite the Dow and S&P 500 posting their worse December since the Great Depression in 1931 and then posting its best year-to-date since 1991, my portfolio over this timeframe outperformed the S&P 500 by a wide margin (4.2% versus -4.4%). This seesaw of a market provided a true test to the high probability trading and durability of this options trading method and yielded an 85% success rate. These empirical data demonstrate that the probabilities play out given enough occurrences over time with varying market backdrops. Over 147 trades, the method has outperformed the broader market by a wide margin in both market conditions. Check out my previous options articles here and here. Disclosure: The author holds shares of GE, USO, BAC, SLB, and AAL via option assignment and may engage in option selling in any of the mentioned underlying stocks or ETFs. The author has no business relationship with any companies mentioned in this article. He is not a professional financial advisor or tax professional. This article reflects his own opinions. This article is not intended to be a recommendation to buy or sell any stock or ETF mentioned. Kiedrowski is an individual investor who analyzes investment strategies and disseminates analyses. Kiedrowski encourages all investors to conduct their own research and due diligence prior to investing. Please feel free to comment and provide feedback, the author values all responses. The author is the founder of stockoptionsdad.com a venue created to share investing ideas and strategies with an emphasis on options trading. Where can I find your book and info? I have a website: https://www.stockoptionsdad.com/ where you can find all the information I presented here as well as links to my YouTube channel, Facebook and Instagram for even more content. The "Complete Guide to Option Selling by James Cordier" was a very enlightening book. Unfortunately due to not having stops in place the customers of their company lost hundreds of millions of dollars this past year. They had all their eggs in one basket and did not hedge. The trade that broke the company and hurt those with investments was Natural Gas. I think you nailed it, diversity of ticker symbols (stocks and ETFs) across different sectors is essential for successful options trading to generate consistent income in a high-probability manner. Probability and volatility are also key too. You can also sell risk-defined trades to avoid the losses you're speaking about above. I'm not familiar with the book but thanks for the positive feedback! How are you calculating the one standard deviation out of the money? What program are you using? I use Fidelity however ThinkorSwim, TastyTrade and any major platform will have this available to you. You can look at the Delta and that gives you the percent probability that the option will expiration in-the-money at expiration. Delta = 0.15 translates into a 15% chance that the stock will be in-the-money at expiration or an 85% the contract expires worthless and you keep all the premium paid out. Thanks for your article. I'd recommend to anyone to read The Complete Guide to Option Selling by James Cordier and Michael Gross. Very enlightening book - they recommend selling options on futures. I'm trying to highlight real-life examples and successes of options trading and emphasis the advantages relative to the broader index. I recently rolled out a YouTube channel covering various topics for options beginners such as covered calls and covered puts.